West Side Reprographics in Riviera Beach and Vero Beach, Florida, delivers solutions for those needing document reproduction and color copying while keeping costs at a reasonable level. 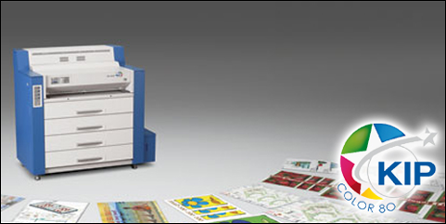 Our advanced printing equipment is capable of providing documents in a wide variety of formats and mediums. The Oce™ TDS800 Printer/Copier can output digital files at a rate of 800 D size per-hour. Not only is it quick but it prints at 600 DPI while giving a crisp and clean print. Whether you are copying old blueprints or printing from a new 3D CAD model, Oce's unique imaging technology ensures you get the best possible output without sacrificing quality. The KIP™ Color 80 is capable of printing a wide range of CAD, office graphics, and commercial graphics. This is a cost-effective way to print CAD plans in color, posters, signs, exhibits, trade show displays, aerials, red-lines, and mark-ups. Prints are made with toner, so they will not run if they get wet. Finally there is a solution for quick turnaround prints and copies without the costly price of inkjet. When cost is important, and photo quality is not needed (Inkjet prints produce photo quality) then KIP prints will serve your needs. Our color production systems produce extraordinarily beautiful prints and copies at high speed (up to 62 pages per-minute) and professionally finished. We can print sizes from 4"X6" to 12.5"X18.9" in paper weights from 64-300 g/m2. Prints can be duplexed, stapled, hole-punched, folded, or saddle-stitched per your requirements. Contact us for color copying and document reproduction for those needing unmatched output qualities.